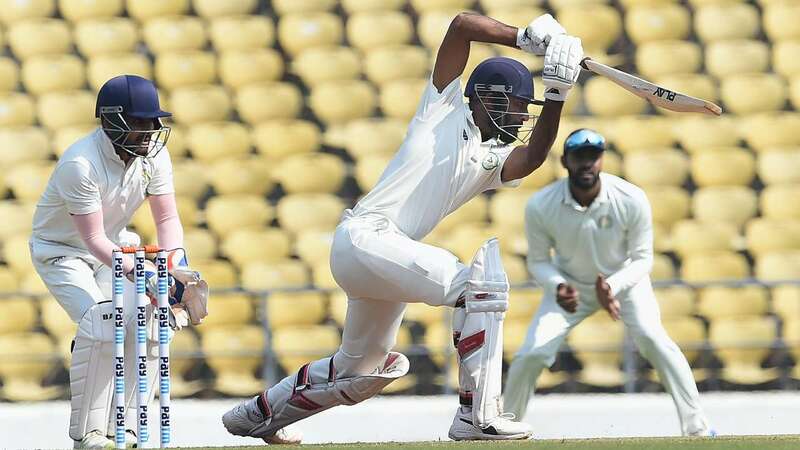 Feb 4 (AZINS) Saurashtra reached 158 for 5 trailing Vidarbha by 154 runs at stumps on day 2 in the ongoing Ranji Trophy final. Snell Patel, who was batting on 87, led the resistance for Saurashtra but Vidarbha bowlers gave their side a little edge going into day three. After bowling out Vidarbha for 312, Saurashtra lost Harvik Desai early. Snell Patel and Vishwarajsinh Jadeja then added 61 runs for the 2nd wicket. However, as Saurashtra looked like settling down, a late burst from Aditya Sarwate tilted the scales in Vidarbha’s favour. Sarwate dismissed both Jadeja (18) and then took the big wicket of Cheteshwar Pujara (1) right at the stroke of Tea. Akshay Wakhare then sent back Aarpit Vasavada (13). Sheldon Jackson too failed to stay for long and fell to Wakhare for just 9. Patel, who was lucky with a couple of close calls, was joined by Prerak Mankad (16 not out) at the close of the play. Earlier, Vidarbha's lower order defied the odds as they added valuable runs after resuming day two at 200 for seven on Sunday. Akshay Karnewar remained not out on 73 while Akshay Wakhare (34) and Umesh Yadav (13) gave him good support.